Nicely played by “Views From The Lake – Eh?“, where the blog author shows clearly and completely how the Conservatives are inept when it comes to managing the country’s finances. I’ve stolen the graphic that was created, but more can be found at the original site. Vote buying has never seemed more obvious. Unfortunately, Flaherty and the rest of the Cons will use their own incompetence as an excuse to privatize everything from the CBC to the CRTC to the CMHC to the AECL and a thousand other useful public services. Naked Capitalism poses a great question: why is there no political outlet for anger on the left these days? The author is looking at the US, but Canadian ‘lefties’ are in the same situation. The inability of the left to create any kind of common voice, either via their own media outlets (which they would have to essentially start from scratch) or other means of communication. The core of the issue lies with the very basic notion of propaganda and/or communications. We don’t own the conversation. Ironically, it’s been the right and – most importantly – the religious right that has been very effective at showing solidarity and unity, the very notions that should be at the core of the left. They repeatedly use many voices to express a common theme and beat the crap out of progressives who are fragmented and appear confused when they have a crack at sharing an opinion on ‘public’ airwaves. While reading some of the comments, I came to another epiphany, something the author is trying to evoke: reading about rebellion is useless. We no longer act. How do we get people to act? We are at the point of needing to panic, as the waves of Cons are just getting more maniacal and controlling. Many people are stopping dead in their tracks out of fear. How do we break those bonds that the Cons have placed on us? Do we start canceling all of our cell phone contracts, cable bills and land lines and start pouring our savings into our own network? Within a year, we’d have a hell of a lot of cash to invest if we actually made this crucial first step. For any of you out there that pay for your electricity, expect to see a big jump in rates both in the short term and the long run. Most of the head-in-the-sand types would argue that it’s because of the rates that are being paid to renewable sources. The truth of the matter is that this is the only thing that the province seems to be doing right. Others would point out that we’re being hi-jacked by profiteers that would continue to gouge the public and industries of Ontario if the Ontario Power Authority were to be privatized. This cannot be tolerated. We’ve also been hearing (and, more importantly, reading on our statement) for several decades a good chunk of our monthly payment goes to debt reduction. 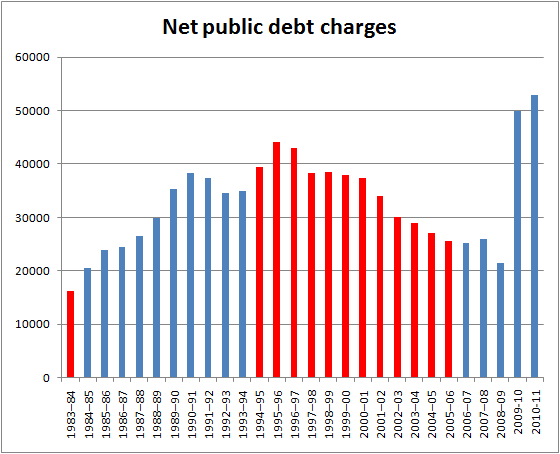 Remember that this debt was incurred in the 1960s and 70s when nuclear power plants were built for the province. Many of these projects were never completed and still many remain unproductive. Some are even paid to not operate and deliver energy. At the core of all of this is the reality that the people in Ontario have been ripped off by nuclear for the past 3 decades as a result of inefficiencies, failed promises and a half-life for waste that will enter the tens-of-thousands of years. The people of Ontario need to demand an investigation into power generation in this province and why we’re still paying for product that has never worked. We should go far as to consider a class-action lawsuit against the builders of Bruce and Pickering plants, even if that includes the AECL. The people of Ontario deserve better management of their electricity source. If we don’t get it, our digital infrastructure, along with other industries, will suffer greatly from this mismanagement.